Hi there! Welcome to Madmissee Mayham! This is our shop! We are listing some really fun, funky, and trendy new brass jewellery items from up and coming designers in Thailand! Relatively new to the American or Canadian market, these are really hot items in Europe right now. Mafia Jewellery! These items are for the trendy, club-going generation who enjoy being edgy and unique. Dare to be Different..Dare to be You!! Bringing you Da NEW FAMILY Jewels!! What You See Here is What We have IN STOCK and ready to move! Please feel free to contact us with any questions you may have in regards to any of the items offered here. We look forward to developing some great business relations and am committed to offering the best customer service available! 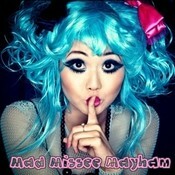 Follow Me on Twitter @madmissee !! madmissee doesn't have any items in their booth! Madmissee is a constant inspiration within the forum arena. Knows H0W T0 talk to members in a neutral way allowing members to help “think for themselves” in order to achieve a positive outcome. I Approve this M0NTdorsement. I just want to thank Leeanne for such a wonderful experience on promoting my booth. Easy and a wonderful communicator, what she offers has done wonders for my booth. Blessings to you Leeanne! Very helpful with suggestions to improve picture of item for sale. After she saw the updated photo, she purchased the item herself. Great Bonanzer. Very friendly and quick with payment. Great member of the Bonanza community! Highly recommended!!! Getting to know this seller has been a pleasurable experience. they have shown themselves friendly and helpful. I encourage all to “take a chance” on this seller. I am sure you will not only not be disappointed but will be thoroughly DELIGHTED! Very friendly Bonanza member. Wonderful booth items, highly recommended. I have not bought anything from this lady, but she’s been very helpful in the forums to various folks. Awesome Seller and Person! A great Asset to the Bonanza Market place! Please take a look at the booth and items! Very friendly seller/buyer. Easy to work with. Much luck here with the “family”!